Artem Nyzhnyk. Lullabies for Eliana. Suite in four movements for Violin, Bayan (Accordion) and Harp. Video demo: Artem Nyzhnyk. Clouds Lullaby. Part I from Suite "Lullabies for Eliana" in four movements. Video demo: Artem Nyzhnyk. Stars Lullaby. Part II from Suite "Lullabies for Eliana" in four movements. Video demo: Artem Nyzhnyk. Sea Lullaby. Part III from Suite "Lullabies for Eliana" in four movements. Video demo: Artem Nyzhnyk. Solar Beams Lullaby. Part IV from Suite "Lullabies for Eliana" in four movements. Video demo: Artem Nyzhnyk. 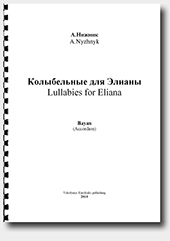 "Lullabies for Eliana". Suite in four movements for Violin, Bayan (Accordion) and Harp. Performed by: violin - Lidiya Futorska, harp - Zuzanna Federowicz, bayan - Iryna Serotyuk.